This is the second post in the Startup Revolution series. The first may be found here. In the last post, we suggested humanity may be approaching—or have already passed—the tipping point between the Industrial and Information Eras. Now we will delve deeper into why the old wisdom no longer seems to apply and blue chip companies are far from the reliable investments they used to be. 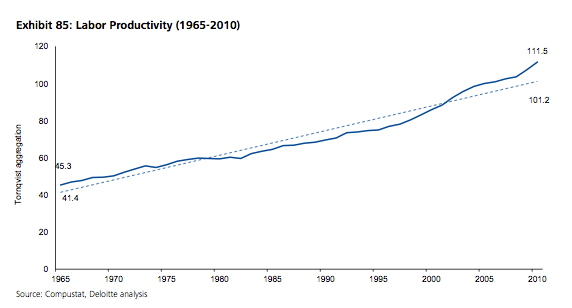 Since 1965, labor productivity has more than doubled. Economists define the inputs to this calculation as number of hours worked and the outputs as industry growth. In some industries, such as technology and telecommunications, labor productivity has grown more than 800%. Productivity is usually considered a key performance indicator for economic growth, so companies are growing faster than ever, right? 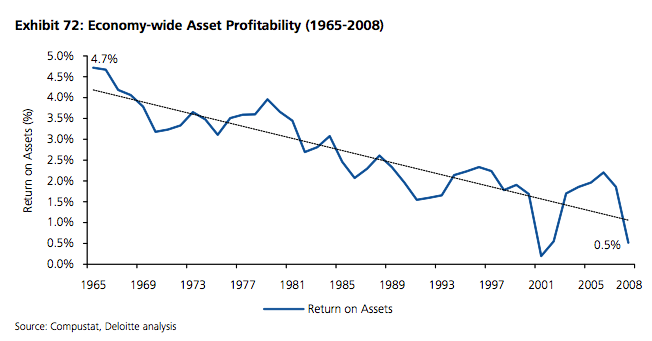 During the same time period, companies experienced a 75% decline in Return on Assets (ROA) and a decline of almost 80% in the length of time an S&P 500 company could expect to remain on that list. Better productivity, worse results. What is going on behind the scenes to lead to such diverging indicators? For answers, we turn to the monumental Shift Index, released in 2009, by John Hagel, John Seely Brown and Lang Davidson of the Deloitte Center for the Edge, that documents the long-term decline of business. While the report focused solely on American companies due to the availability of data, it would be a mistake to assume their conclusions are purely US-based. 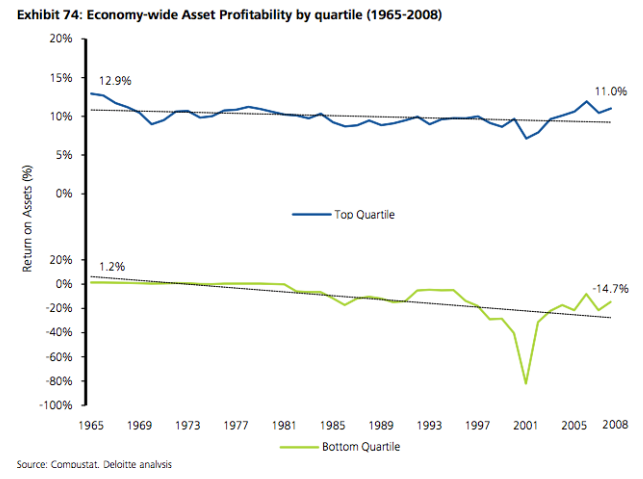 They found two clear trends that cannot be ignored: declining company performance and an increasing topple rate. First let’s look at the what, then we’ll explore the why. While there are a number of ways to measure growth metrics (such as return on invested capital), the Shift Index authors focused on ROA as it measures how much a company is able to do with what is has — in other words, how much profit it can make by turning its inputs into outputs. When they reviewed data for the past 45 years, the authors and the community at large were equally surprised to find a drop of 75%. And while recessions in 2001 and 2008 clearly added to poor performance, the graphed results show a long-term trend that’s challenging to explain away as the result of anomalies. At the same time, anyone who has spent much time with statistics knows that averages can provide useful high-level perspective, but can also skew conclusions if a small number of data points vary widely from the rest. So to gain a sharper perspective, the authors separated the companies into performance quartiles. The results showed “The ROA Performance Gap between winners and losers has increased over time, with the winners barely maintaining previous performance levels, while losers experience rapid deterioration in performance.” In other words, not only were poor performers dropping rapidly, even the best companies were only stagnating. In addition to declining performance of the blue chip category, it also appears the success of market leaders is increasingly short-lived. So those at the top aren’t staying there long. What about those at the bottom of the market? Now that we’re clear about what is happening, the most important question to answer is why. It would seem to be a paradox -- increasing productivity along with declining results but there is an answer. In a word, it’s pressure. During the Industrial Era, companies were somewhat insulated by low levels of competition, information obscurity and growing consumption. But the Information Age has made those barriers more obsolete than castle walls after the introduction of gunpowder. Let’s look at the three new fronts they must face in detail. Competitive intensity has more than doubled during the last 40 years -- as measured by market concentration -- due to falling barriers to entry and economic liberalization. Falling barriers to entry. It used to be far more difficult to start a company. There were people to be hired, plans to be developed, capital intensive production to finance and a lot of legwork to expand, market by market. Today’s technology means a business can be started inexpensively and quickly with cloud-based services, freelance talent, and plug and play technologies. This means more entrants and consequently a dramatic increase in competitive intensity. Economic liberalization. We live in an increasingly globalized world, that makes global communication and shipping exponentially easier than it has been at any time during human history. In many instances, once a business is up and running, markets are inherently global overnight. 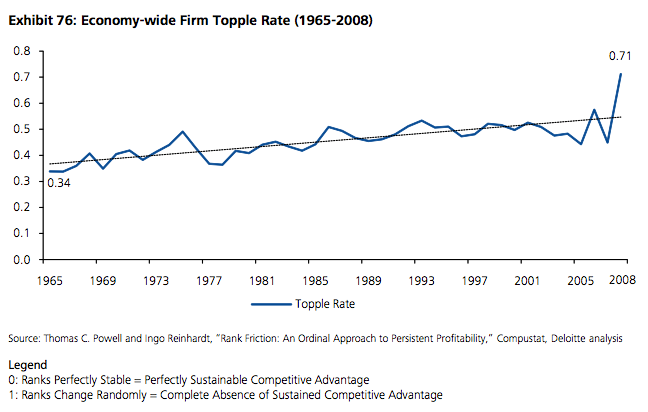 Companies no longer compete solely in their domestic geography, but against firms from all over the world. The world has changed so completely it can be hard to recall the ‘quaint’ days when most of what we knew about a product was from a TV commercial or what the car salesman had to tell us. These were the glory days of branding, when a company could define its own image and then communicate that with clever marketing as long as they had the money to spend on ads. But this advantage of large companies has disappeared in the wake of information transparency. Consumers can find the best price of a flight on Kayak and the most inexpensive product for their needs on Google. Increasingly pricing information is available real-time at the point of purchase, lowering prices and squeezing profit margins. They can also find the highest rated dentists on Yelp and product reviews on Amazon. This same transparency applies to B2B offerings as well, with price and quality comparison tools available for almost every industry. If there is a niche left where transparency doesn’t exist, you can be sure someone is working on a solution to fill the gap. Branding is far from useless, but it is no longer a golden goose. 47% of people strongly agree there isn’t much cost associated with switching brands. After a long period of post-war consumption increase, people are buying fewer new goods than ever before. Not only has the economic downturn thinned the pocketbooks of the middle class, consumers are embracing more successful sources of fulfillment in engaging experiences and lasting relationships, shifting demand from shiny new goods that ‘promised’ happiness but consistently failed to deliver. Consumers are also increasingly selling or sharing their fixed assets when they aren’t being used. eBay and Craigslist created a thriving used goods marketplace, ZipCar showed the world that owning a car wasn’t always necessary and AirBnB built an entire industry out of previously unused guest bedrooms. These trends are supported not just by frugality but an increasingly environmentally conscious population that wants to minimize their impact by re-using what has already been produced. More dollars in the peer-to-peer economy mean less in the traditional producer-consumer marketplace, and many of the companies thriving today are facilitators rather than peddlers. 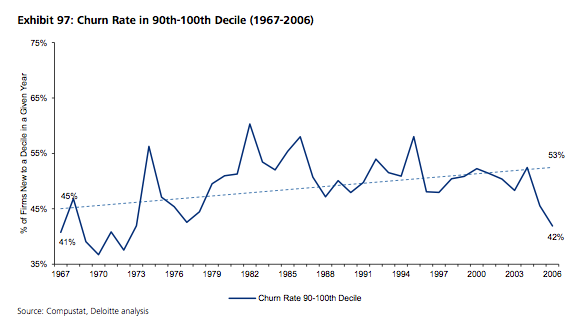 How can blue chips respond? There are generally two main levers to increasing profitability -- either increase revenue or decrease costs. Many business schools have trained executives in the science of efficiency. Think just-in-time manufacturing, workforce reduction and economies of scale and you have the concept down. This worked very well as a lever for decades, until efficiency was reached yet competition continued to increase. Essentially, you can’t cost-cut your way to success forever. The other lever, of course, is increased revenue. This usually means more and better marketing, supported by a suite of segmentation and analytics tools that make every dollar spent as impactful as possible. This often does create a spike in sales -- until once again, the limits have been reached even as competition heats up. Marketing is powerful, but it isn’t the silver bullet either. Some companies still have runway to improve with either one or both of these levers, but increasingly many are hitting the upper limits of what can be done with the tools of the past. This is yet another sign that the Industrial Age is coming to a natural close and a new era is beginning. In the next post, we will explore a third option, one that’s given rise to the explosion of new high-growth technology companies around the world: Innovation.